Are Buckwheat and Groats Gluten-Free? Buckwheat likely sounds scary if you're on the gluten-free diet. But despite its name, buckwheat is not wheat. It’s a seed rather than a grain, which means it's gluten-free and safe for people with celiac disease and non-celiac gluten sensitivity. Roasted buckwheat groats, also known as kasha, also are gluten-free. Buckwheat and wheat are not closely related. In fact, they come from completely different botanical families. Buckwheat seeds are technically the fruit of a plant called Fagopyrum esculentum, while wheat berries are the ripe seeds from plants in the genus Triticum. Buckwheat is most closely related to rhubarb, which is grown for its pink stalks. Unlike rhubarb, buckwheat is grown for its seeds. Although buckwheat is not a grain, it is sometimes referred to as a "pseudocereal." For processing into food, buckwheat seeds must first be dehulled. The remaining seed material, called groats, can be ground into flour. Because buckwheat is processed similarly to the gluten-containing grains wheat, barley, and rye, it may be processed in the same facility and on the same equipment as gluten grains. Therefore, even though buckwheat is naturally gluten-free, you should stick with a brand of buckwheat flour or buckwheat groats that are labeled "gluten-free"; that way, you will be sure that your buckwheat wasn't cross-contaminated with gluten in processing. In addition, even though buckwheat is a popular ingredient in gluten-free cereals, baked goods, and other products, not every product that contains buckwheat is gluten-free. Therefore, you always should read ingredients labels on any buckwheat-containing product you buy, and consider sticking only with products that are specifically labeled "gluten-free." Soba noodles are traditionally made from buckwheat flour. However, you need to be careful with these, since many brands of soba noodles are not gluten-free—they contain wheat flour along with buckwheat flour. King Soba noodles are a widely-available brand of soba noodles that are gluten-free. There are several different brands of buckwheat and kasha on the market. Not all buckwheat products are considered gluten-free. Although buckwheat is naturally gluten-free, it can be subject to significant gluten cross-contamination while it's being grown and processed. These are certified gluten-free, meaning they should contain less than 10 parts per million of gluten (less is better). They suggest using the flour for making soba noodles and pancakes. Arrowhead Mills also offers a buckwheat-based gluten-free cereal, Organic Maple Buckwheat Flakes. Birkett Mills offers a variety of buckwheat products ranging from whole groats to pancake mix and cream of buckwheat cereal. Although the company also processes wheat, its buckwheat is processed on dedicated equipment in a self-contained mill. The grain shipments are also cleaned prior to processing to remove any stray gluten grains. Birkett Mills says it tests to ensure buckwheat products contain less than 20 parts per million of gluten (the legal limit). You'll find these products online and in stores that carry a full array of Bob's gluten-free products. The company processes its gluten-free products in a separate facility that also processes gluten-free oats, and tests the products to ensure they contain less than 20 parts per million of gluten. However, read the label with care as some of their buckwheat products are not gluten-free. Be sure to look for the gluten-free mark. Their buckwheat flour is not gluten-free. There are plenty of good reasons to eat buckwheat. It's high in protein and B vitamins and rich in phosphorus, potassium, iron, calcium, and lysine. Buckwheat is also a good source of fiber: a one-cup serving of cooked buckwheat groats provides 17 grams of dietary fiber (you should get 25 to 35 grams of fiber every day). It also contains 22 grams of protein. Since getting enough fiber when you can't eat gluten can be problematic, buckwheat can help. 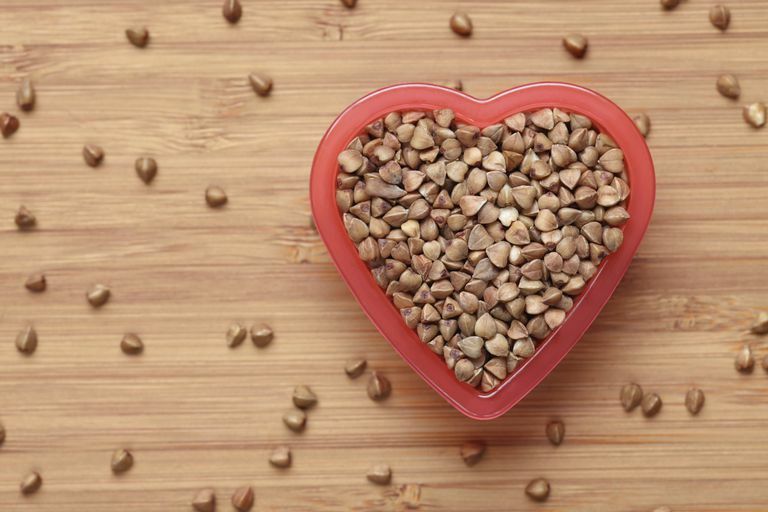 There's even some preliminary evidence that buckwheat can help to lower cholesterol levels. You can use buckwheat flour in cooking. Buckwheat groats can be used as a hot breakfast cereal; for example, try these delicious maple pumpkin pie buckwheat groats instead of oatmeal. Buckwheat also can be used as a substitute for rice or pasta in some dishes. Tomotake H, Kayahita J, Kato N. Hypolipidemic Activity of Common (Fagopyrum esculentumMoench ) and Tartary (Fagopyrum TataricumGaertn.) Buckwheat. Journal of the Science of Food and Agriculture. 2014;95(10):1963-1967. .